More than 60 scones were consumed on a beautiful summer afternoon. In a very poor June, the sun shone and the rain stayed away. A choice of cake, Devon Scone or Cornwall Scone were on offer, all covered with Jill Hitchman’s delicious strawberry jam and Devon clotted cream. These were washed down with numerous cups of tea or coffee. As with all St Andrew’s events, helpers were in abundance, making the afternoon easier for the organisers. The afternoon got off to a surprising start. A coach load of American, New Zealand and Australian tourists arrived unexpected, having just visited the church. They were delighted to taste their first ever “cream tea” and the tour guide promised to bring more tourists later in the year! 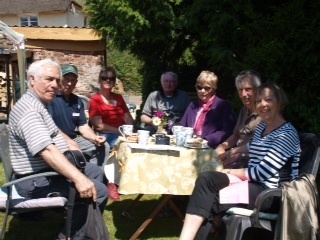 Almost £300 was raised for church funds and a very relaxing afternoon was enjoyed by all, even those serving the teas.